This entry was posted in Friends of Marcus Fabrics, New from Marcus Fabrics, Quilting Projects and tagged ebook, fabric giveaway. contest, Marcus Brothers, Marcus Fabrics, martingale, Martingale That Patchwork Place, quilting, Vicki Bellino by Lisa Shepard Stewart. Bookmark the permalink. CONGRATULATIONS to Terry Ptaszynski, winner of our random eBook giveaway! I’ve been looking for a book on epp, would love to win! How lovely. EPP is so relaxing. Oh what I could do with the patterns in Vicki Bellino’s latest book. Can’t wait to see Vicki’s new book. Thank you for a chance to win a copy! Interesting looking book – would like to add to my collection. Thanks. From northern Iowa. . . . .
Looks like a great book, thanks for the giveaway. Thanks for a chance to win this wonderful book. I love everything about piecing 30’s fabrics. I purchased my first Aunt Grace fabrics to make my first quilt over 20 years ago. I still have a few snippets of fabric I am saving for posterity!! A winning combination -EPP and my favorite, 30s fabrics! I’ve hooked hexie but not sewn them, would love to win this book. 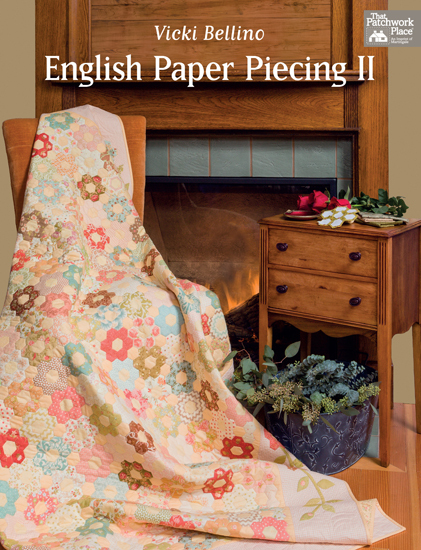 I enjoy doing english paper piecing, so would love to win this wonderful book. Thanks for the chance. Just started English paper piecing iLucy Boston blocks, absolutely love it. Love the quilt on the cover of your book. I have her first book & sure would love to have her new one. Thanks for the chance to win one. This looks like a fun book–I love EPP! The fabrics are cute too! Would love to learn this technique!! Thanks for the opportunity!